Nottingham Wedding and Family Photographer - Why wait? 4 reasons why you should stop putting it off and book a family photography session now. Why wait? 4 reasons why you should stop putting it off and book a family photography session now. We spend so much of our lives thinking we’ll look better in the future. Or, worse still, in the past. What we don’t realise is how good we look now! It’s so easy to assume that we’ll look better in six months, that we’ll loose those extra few pounds, your kids will behave better when they’re that little bit older or maybe just that your husband won’t enjoy it. The trouble with that philosophy is that we never get to enjoy how we look now. So I want you to lay your worries to one side and stop putting off booking your family photo shoot. Here’s why. We know you’ll want to look your best in your family pictures - of course you do! And we know people are often concerned about how they look, maybe they want to loose of a few more pounds, or wait until after their next holiday so they’ve got a great sun tan! By thinking we’ll look better in the future we don’t enjoy what we look like today. Right now, you’re as young as you’re ever going to be and if you’re worried about loosing a few pounds, don’t! It’s amazing what a skilled photographer can do by positioning your body or positioning kids carefully to get a great group shot where everybody’s enjoying themselves and looking beautiful. One of the main reasons we focus on outside photo shoots is they are FUN! If your child loves getting outside, getting muddy and messing around then they’ll love these shoots. There won’t be any sitting them down on an antique chair with a cute old teddy in front of a white background. No telling them to watch out for that cable or not to run around in case they knock something over. We’ll let your kids run free and explore the environment and get photos of them, and you, enjoying themselves. We’ll do a few group shots of you all together (if you want that) once they’re a bit more relaxed and willing to join in but we’ll keep these nice and relaxed. We find the best shots are the ones where someone sticks a tongue out and everyone laughs. So what! 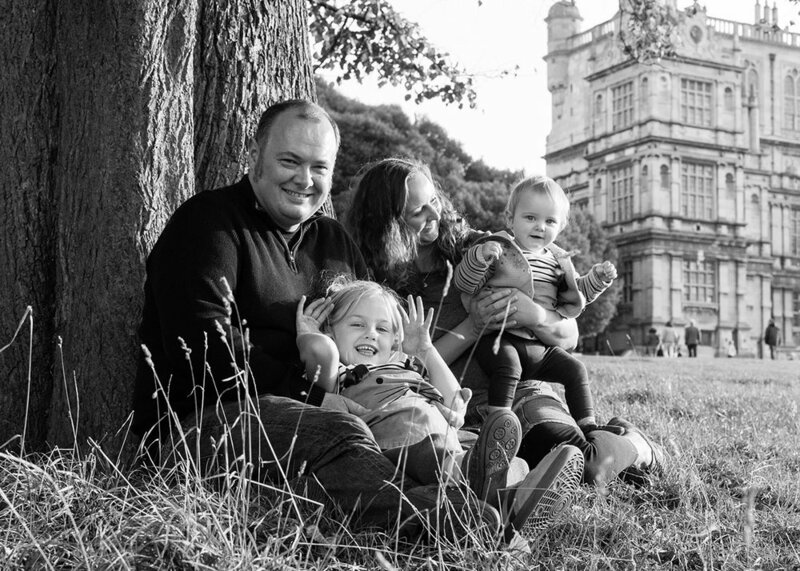 We love a bit of mischief in our family or children’s photography sessions - we’ve even known there to be a bit of messing around from mum or dad! It all adds to the fun of an hour or two of dedicated family time away from iPads, playstations, and other such distractions. When you think about it, for a kid, going for a walk with a complete stranger, who’s talking to you about things you like, laughing and joking and above all pointing a camera at you is pretty strange. For most kids, it’s not something they’re used to. Why would they be? We think it’s really important to know and understand that. So we expect them to behave a little differently from how they might usually. 99.9% of the time, kids being a bit silly pulling silly faces, or messing around in the woods results in great photos - so we love it! We’re so convinced that you don’t need to worry about your kids behaviour we wrote a whole separate blog about it here. I can certainly sympathise with this and if you really don’t want to be in the pictures that’s absolutely fine, we can do photo shoots with just the kids. However before you decide for sure, we’d like you to consider a couple of things. Firstly, you’re not getting family photographs just for you, you’re getting them for future generations, for your kids, grandkids and even great grandkids! Isn’t it wonderful looking back at old family photos in a dusty photo album? So you might not care about photos of you, but future generations certainly will. Secondly, life can be unpredictable. Unfortunately things happen without warning and loved ones pass unexpectedly. You never know when you next might have an opportunity for a family portrait. I certainly value photographs of my mum so much more since she has passed and yes, I do wish we had more pictures of her, but she never wanted to be in pictures. What you’ll get is high quality photographs that’ll last a lifetime - or even longer! What you’re investing in is your family’s legacy. There’s no other family like yours and your family memories right now need documenting. So stop putting off a family photography session and book now.